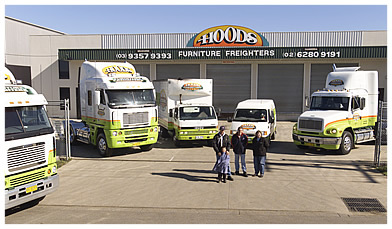 Hoods Furniture Freighters has evolved from a business started in Melbourne four generations ago by the Hood family and today is owned by David and Kerry Hood. As a business primarily doing removals, in the early years Hoods Furniture Freighters started specialising in new furniture and antiques over 33 years ago doing a run into Sydney. 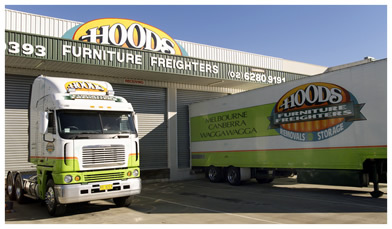 Today, Hoods Furniture Freighters business is 95% new furniture and antiques and have a furniture semi trailer service into Canberra almost every working day. Kerry and David Hood joined the family business 24 years ago and although very experienced and knowledgeable in furniture transport with over 24 years experience they are aged in their early fourties and bring to the company, with their ownership, continued innovation, modern customer service ideas and the energy required to run a dynamic operation. What really sets us apart from all other removal services is that our staff will always give you a personal and caring service because we have pride in being a fourth generation family business operating successfully since 1922. The experience of our team is built on solid experience and professional training in the latest removal techniques. We are skilled in handling your valued possessions, and there will always be a member of our executive on your job to direct the moving of your possessions. "We have moved many times in the past thirty years because of the Air Force and have never seen our furniture handled, wrapped and packed in the truck the way you did today. Thank you. I would recommend your company as the best I've seen in thirty years." Furniture relocation - Canberra to Melbourne 12th July 1999.